The machine pool of the heavy artillery display mainly dates back to the period from 1930 to 1960, and the majority of the items formed part of the armament of various countries in World War II and during the Cold War. The exhibit also features a range of vehicles used by the Estonian Defence Forces in the 1990s and even later. The focal point of the exhibit are 24 guns and three mortars donated by the Finnish War Museum. The selection includes howitzers and guns, light infantry guns, anti‑tank guns and anti‑aircraft guns. The more robust pieces are a Soviet 130‑mm M-46 gun and a German 88‑mm anti‑aircraft gun 8.8-cm-FlaK 18/36/37, and the collection also includes a 150‑mm gun. The visitors are often fascinated by the German Sturmgeschütz III self‑propelled gun; the Finnish army acquired these guns in World War II and kept them in its armaments until the 1960s. The Swedish Tgbil m/42 armoured vehicle was part of the weaponry donated by Sweden to the Estonian Defence Forces in the 1990s. In 2015, an exhibit on Estonia’s 11‑year military mission to Afghanistan was opened in the hangar. The highlight of the exhibit is a sauna that the Estonian soldiers built at the Camp Bastion base camp in Helmand Province. Once the operation ended, the sauna was returned to Estonia and reassembled in the museum. The exhibit displays the equipment, weaponry, gear and uniforms of Estonian soldiers during the Afghanistan mission. The photographs depict the service and daily life of Estonian soldiers at Camp Bastion and smaller patrol bases and control points. 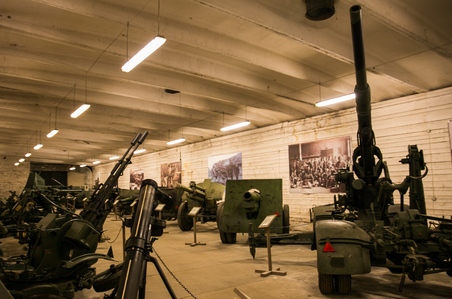 The artillery guns and military vehicle hangar is located 300 metres from Viimsi Manor and is open from May to October, on Fridays, Saturdays and Sundays from 11 am to 6 pm. Group visits outside the opening hours must be scheduled beforehand.